The 11 P's of an Afrocentric trauma system for South Africa: time for action! The 11 P's of an Afrocentric trauma system for South Africa -time for action! A trauma system involves the interaction of prehospital care, emergency centre care and definitive care (including prevention and rehabilitation services), providing an organised approach to acutely injured patients within a defined geographical area, from primary care to advanced care. Trauma is, after infectious disease, the second leading cause of death and disability in Africa (Table I), and must therefore feature on the national health agendas of all African countries.1-4 The requirements for developing cost-efficient, patient-centred trauma systems relevant to South Africa are outlined below (each item commencing with a P, and hence the title). While most regional hospitals can manage surgical emergencies, many district hospitals and community clinics have neither the clinical skills nor the equipment to undertake complex care of major trauma. Delays are thus caused through multiple levels of transfer, leading to higher morbidity and mortality. Transfer pathways are further hindered by the 'devil of distance' to definitive care. Provincial transfer policies must be flexible and EMS-driven to enable clinically based decisions to rapidly get the patient to the optimal level of care. Provincial staffing plans should establish posts for specialists in emergency medicine and surgery at regional hospitals and sub-specialist trauma surgeons at tertiary hospitals to oversee the implementation and maintenance of the system. In South Africa and elsewhere in Africa, care provision is a dichotomy. The highest proportion of health expenditure in South Africa is by the financially privileged and in the private sector, with a considerable amount also spent on chronic care of preventable disease in indigent patients. The private sector has well-resourced facilities but, being private, it follows that specialist medical staff in independent practice are not obliged to accept referred patients and to treat trauma except in life-threatening emergencies. The medical officer in a private emergency unit often has to try to refer the patient to a public facility for further care.14,15 This problem may be addressed by integrating the unconditional payment for comprehensive trauma care within a nationally funded care plan. The private sector also has skilled allied health and nursing personnel who can add value to the development of universally accessible and applicable systems. In the developed world, the assessment and designation of facilities as trauma care centres within a trauma system is undertaken by means of defined criteria compiled by professional organisations (e.g. American College of Surgeons Committee on Trauma) that have the expertise to assist the government in assessments and provide unbiased opinions on facilities to meet the criteria. In South Africa, the Trauma Society of South Africa (TSSA) established such criteria, accepted by the Colleges of Medicine and the Health Professions Council of South Africa.16 It therefore makes sense that the TSSA, as a group of trauma professionals, assists in this task in South Africa. South Africa has a dearth of data. Government could consider universal implementation of the Trauma Society Trauma Bank in all public regional and tertiary hospitals; this would build up an accurate and comprehensive picture of the burden of disease of more severe trauma, to extrapolate the findings to public policy. Quality data can revise practice in line with good governance principles. Data from before-and-after studies of implementation of trauma systems show reduced overall costs and nonetheless improved outcomes.10 Additionally, health care funders can justify equipment and human resource expenses for cost-efficient care. Rehabilitation services are not a priority in South Africa. However, international experience proves that early rehabilitation services increase the ability to re-establish economically productive employees for work. In most parts of South Africa, there are only acute in-hospital rehabilitation or long-term outpatient clinic-based facilities. Only one province has a formal 'residential' multidisciplinary rehabilitation service for longer-term rehabilitation (Western Cape Rehabilitation Centre (WCRC) in Cape Town). This shortage blocks acute beds with patients who need post-acute in-facility rehabilitation, since they cannot be discharged to an outpatient service. The private sector has such facilities, and public-private partnerships could potentially provide these to a wider population. This sorely needed aspect of the system would have to be built up from scratch.  audit and refinement of the system until improved outcome is demonstrated. Trauma systems improve survival and decrease morbidity - but can only do so after universal acceptance and sustained application. 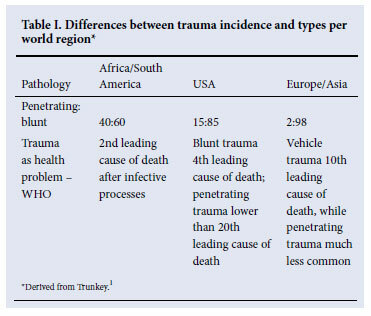 The incidence and impact of South Africa's trauma burden can be reduced through the development and implementation of an Afrocentric trauma system that provides efficient, timely and cost-effective care. It is time to move from 'islands of excellence in a sea of indifference' to a co-ordinated patient-centred system. Timothy Hardcastle is a trauma surgeon and Deputy Director of the Trauma Unit at Inkosi Albert Luthuli Central Hospital, Durban, and affiliated to the University of KwaZulu-Natal.